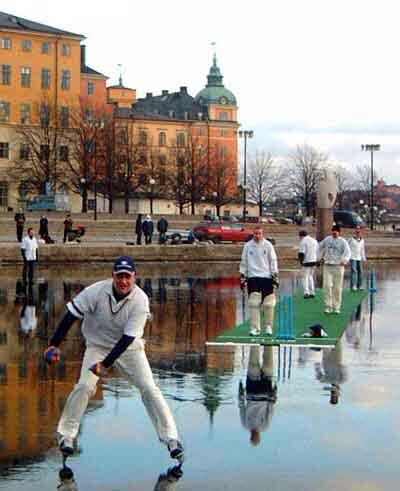 wished the picture links worked here - cricket on ice. quote "Zimbabwe do seem to have performed quite well. Better than they played in England when we could more or less roll them over twice in a day. But, considering they still need over 200 runs with only 1 wicket left to even make the ozzies bat again, it is still a sadistic 1 sided gang battering, but I dare say they're used to it by now. If the Bangas weren't around, I would feel sorry for them." bear in mind two aussie bowlers had to retire so the bowling attack at teh mo' is lee, bichel, martyn and lehmann. Yeah, I concede that, which is why they got a better score second time round. The pic link does work now. Pretty cool. "resulting in what was probably the largest and fastest outfield ever, with the long boundary being at least 150 kms long"
Not even Jonty Rhodes could run that down without giving up runs. When will Cricket be played in mountains, on skis? This says it all, dont you think? "...Jason Beer 40 retired/out - lost a ball into unfrozen water!..." "A depressed Shane Warne considered leaving Australia in the wake of his drug ban, and qualifying to play for England instead, according to a report in today's London Sunday Times. Kiwis givin' the curry-munchers some grief!! The Curries probably feel like we did in the first 2 tests against SA. Hopelessly unable to get cheap wickets. Still, run rate isn't so high. Still quite possible for India to win. With a bit of luck. "89.4 Khan to Styris, no run, outside the off, angled across the batsman, and Styris leaves it alone, and now everybody drops to the ground to avoid the swarm of bees! (This is, real, not from a Monty Python sketch.)" Even the bees are ardent cricket supporters in your country Ag. Well, India appear to have had it now. Draw or loss time now. Zim seem to be struggling against what is perhaps the weakest Ozzie attack for quite a long time. SA havn't done so badly against the Pakis. Wow! 630/6. Surely, if the Kiwis can do that, Tendulker/Dravid/Sehwag should be able to put on at least 1500. Concur. Must be a tame wicket, eh? India should score big. Unless it starts to crumble badly. Probably now I understand why Ian Chappell called him "Very Very Special." Saved India a lot of blushes, no doubt about that. Yep. At least India and Laxman, and your Bees, held out for an easy draw. Time to act on Sehwags advise and produce some good turning pitches I think. Bangladesh took 21 balls to get off the mark after winning the toss, and no sooner had Omar scored the first run in Tests between the two sides than the heavens opened.